British blockade of war materials and food extended to whole of France. De Gaulle forms French Volunteer Legion in Britain. Turkey announces that she will stay out of the war. German forces of Army Group North capture Donaburg in Latvia. The Luftwaffe carries out raids on Leningrad. Heavy fighting in the Bialystok area as the German Panzer’s units close the pocket. Finland declares war on the Soviet Union. Spanish volunteers organized to fight with Germany against USSR. 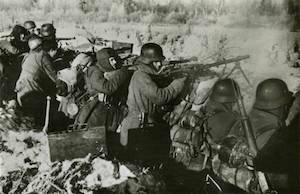 German troops capture Kupyansk over the river Oskel, for use as a launch pad for their summer offensive. At Rastenberg, Adolf Hitler decorates SS General Eicke, Commanding Officer of the SS Totenkopf Division, with the Oak Leaves for the Knight’s Cross, for his Divisions bravery in holding out in the Demyansk pocket the previous winter. Eleven of Eicke’s officers and men also receive the Knight’s Cross. After the ceremony, Hitler and Eicke chat and Eicke tells the Fuhrer that his Division is pretty well worn out, short of vehicles and wishes it to be transferred to France. Instead, Hitler gives Eicke home leave. Italian aircraft strength is increased on Sicily by withdrawing aircraft from Libya. This allows the Italians to step up their air attacks against Malta. Rommel is made a Field Marshal and launches attacks against Mersa Matruh. Meanwhile, Kesselring, Cavallero (Italian Chief of Staff in Rome) and Bastico (Italian C-in-C in Libya) arrive at Rommel’s HQ and give permission for him to continue his advance in to Egypt. The Grumman F6F Hellcat fighter flies for the first time. US troops enter Cherbourg taking the German garrison commander prisoner. The British launch Operation ‘Epsom’ in the Odon Valley West of Caen. In response to recent communist sabotage, the Germans introduce a curfew in the Copenhagen area, making it illegal to be out in the streets between 8pm in the evening and 5am in the morning. As a result, the citizens of Copenhagen begin a massive general strike. Hundreds of thousands of Danes take part. The Chindits take Mogaung, with Chinese help.